Toronto, Ontario – January 14, 2014 – Maintenance Assistant today announced “MA Monitoring™”, the latest module in its category-defining, cloud based Computerized Maintenance Management Software (CMMS). MA Monitoring enables real-time work orders and notifications to be created from the meters, triggers, alerts, alarms and state data provided by equipment and control monitoring systems. “I am delighted to announce the release of MA Monitoring™”, said Marc Castel, CEO. “It’s the first of many machine-to-enterprise technologies from our incredible pipeline of innovations that continue to revolutionize the industry. Directly accessing live machine data will help improve maintenance response times, eliminate inefficiencies and ultimately drive more money to the bottom line”. “It’s our vision of the future, where devices communicate directly with Maintenance Assistant CMMS”, explains Daryl Sedgman, Company President. “This new technology promises to redefine best in class maintenance”. MA Monitoring™ integrates directly with machine or control systems over standard protocols, creating a direct real-time interface without requiring any custom integration, which is absolutely unheard of. The new module will automate the receipt of data and subsequently trigger corrective maintenance and send real-time alerts to all relevant maintenance personnel. “We are leveraging our unique, modern multi-tenant architecture to turn complex enterprise-wide systems into simple maintenance solutions” said Bob Kandic, chief software architect. “Currently, integration with oBIX (Open Building Information Exchange) is available with further data protocols to be rolled out over the coming months through our technology partners.” Right now, data can be pulled directly from an oBIX server containing any number of connected devices. 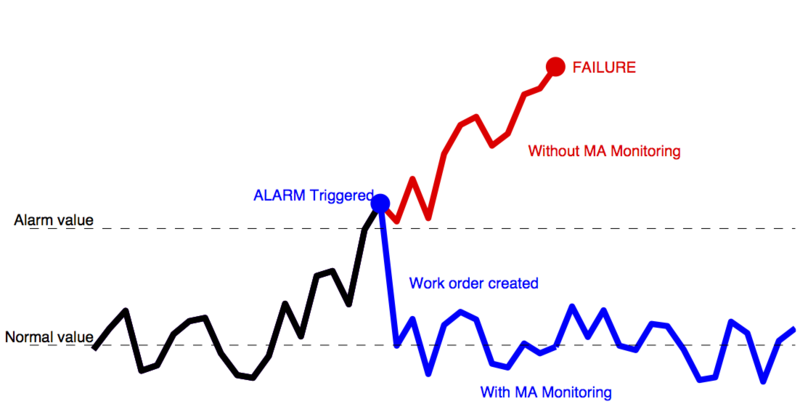 When abnormal operating conditions occur, MA Monitoring triggers a work order in the CMMS, notifying Technicians and engineers immediately of a pending problem so corrective action can be taken and a system failure avoided. Furthermore, organizations with a preconfigured oBIX server can export their data to Maintenance Assistant CMMS with the click of a button. “When connected to the oBIX server, MA Monitoring™ can extract the entire asset hierarchy, data points and pre-configured scheduled maintenance and instantly import them into MA CMMS – you can basically build your entire CMMS from scratch in seconds”, said Jeff O’Brien, Director of Customer Success. Additional assets not part of the oBIX system can be easily added as needed. Maintenance Assistant is a modern technology-company who’s flagship product, MA CMMS, has become an essential operational and management tool for managing scheduled and unscheduled maintenance of assets such as buildings, manufacturing plants and equipment. “Our mission is to be the cloud-based Maintenance Software and solutions partner of choice by focusing on product excellence, an outstanding customer experience and an easy-to-understand low monthly price,” said Marc Castel, CEO. Maintenance Assistant helps companies drive down the cost of maintenance, work smarter and save money by helping to increase asset life, prevent equipment failure, track maintenance costs, improve productivity, reduce equipment downtime, and lower the total cost of ownership of equipment, while at the same time improving legal, regulatory and audit compliance.